You can create a custom HTML error page that will be presented to users who are blocked by the Fastly WAF response object. The attributes of the response object include the HTTP status code, the HTTP response text, the content type, and the returned content. 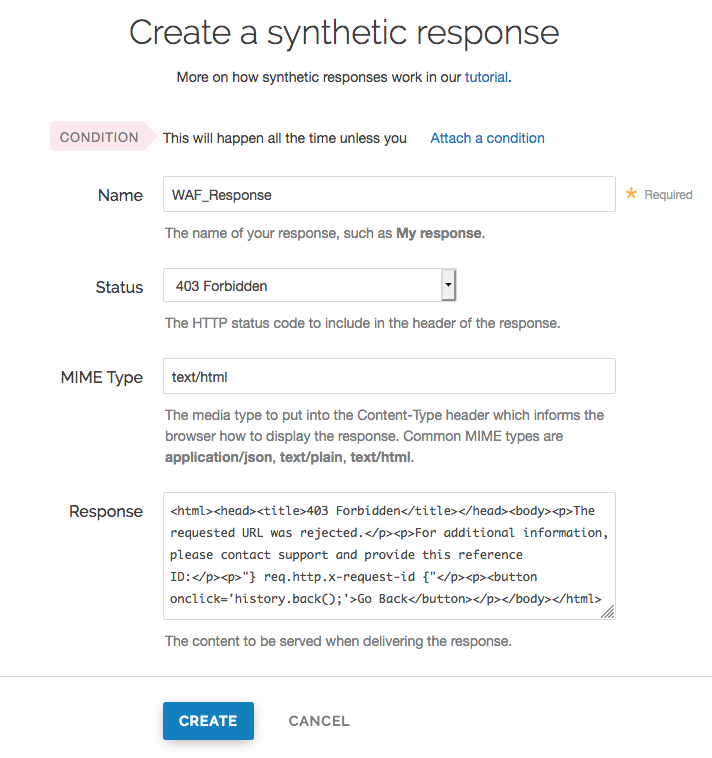 create a synthetic response to present the user with an HTML response. The error page will display the transaction ID, something that might be useful if, for example, the user decides to contact your support team. In the Name field, type WAF_Response. From the Status menu, select 403 Forbidden. In the MIME Type field, specify the Content-Type of the response (e.g., text/html). In the Response field, enter the following HTML. This response will display the value of req.http.x-request-id. You can change the composition of the transaction ID if desired, but care should be taken to minimize the probability that multiple requests within a desired window of time (e.g., per day) have the same transaction ID value. A VCL Snippet was used to simplify the example presented and is not explicitly required for a custom WAF error page. Alternatively, you can use custom VCL to create the transaction ID. It's useful to include the transaction ID in the request and WAF logging formats to allow multiple messages generated for the same request to be correlated.